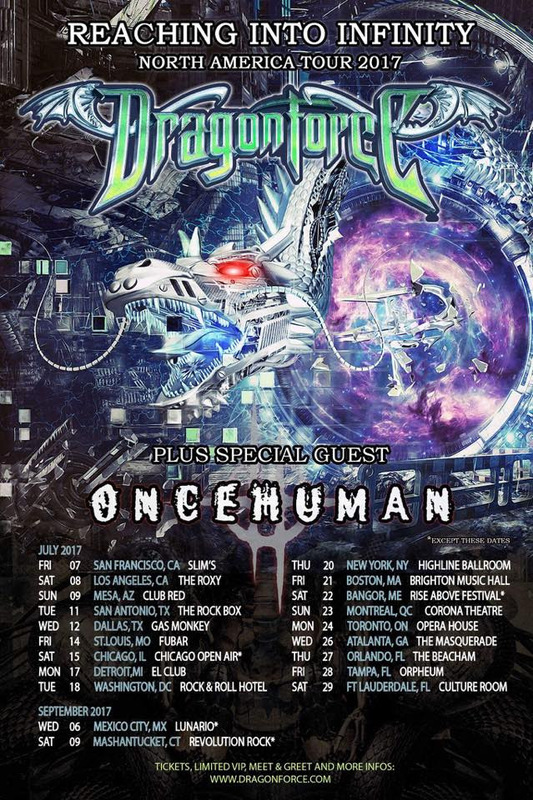 Long-running metal goliaths DRAGONFORCE will kick off a near-month-long North American tour this Friday with support provided by Once Human. Slated to commence July 7th in San Francisco, California and run through July 29th in Ft. Lauderdale, Florida, the tour includes a stop at Chicago Open Air in Chicago, Illinois which features Ozzy Osbourne, Slayer, Amon Amarth, Megadeth, and Clutch, among many others, as well as Rise Above Festival in Bangor, Maine with Korn, Stone Sour, Seether, Crobot, and more. See all confirmed dates below. DRAGONFORCE will be touring in support their Reaching Into Infinity full-length recently released in the US via Metal Blade Records. The chart-topping offering earned the #5 spot on the Billboard Hard Music Albums chart, #12 on the Billboard Independent Albums chart, #16 on the Billboard Rock Albums chart, #48 on the Billboard Digital Albums chart, #58 on the Billboard Top 200 Current Albums chart, and #70 Billboard Top 200 chart!